Starting in 2014, the AFC began to assess the changing HIV landscape, taking into account the newest scientific breakthroughs, roll-out of the CDC’s High Impact HIV Prevention strategies, and implementation of the Affordable Care Act. In 2015, the AFC hired national consultant, Sam Avrett of The Fremont Center, to facilitate a formal strategic planning process. 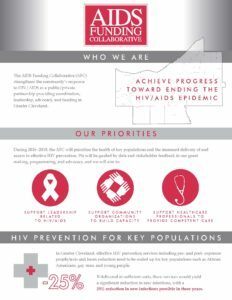 Through the process, the AFC’s advisory committee had the opportunity to assess the broader context of national and local HIV funding trends, epidemiological data, as well as intersecting health and human service needs in Cuyahoga County, to ultimately inform the strategic focus of the AFC.